The day that the Raspberry Pi launched: 29 February 2012 the 10,000 units sold out in 1.5 hours. After 6 years of development it must have been a great moment for those behind the development of the world's cheapest computer. So what is it? 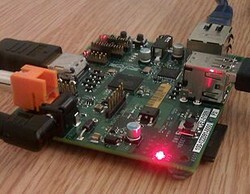 The Raspberry Pie is a credit-card sized computer board. No screen, no laptop, no case (though one may be coming later). Hell there's not even the standard battery used to keep the internal clock working when the power is cut. Its not very pretty - in fact its the exact opposite fo the oh so elegant, pretty and expensive Apple computers that we are all so familiar with. The reality is that - almost all of us these days, already have most of these items lying around - so getting your kid playing around and making their own computer is going to cost less than the most basic lego set. USB to Micro-USB Cable - 6 Ft.
Who Is The Raspberry Pi Designed For? The philosophy behind Raspberry Pi (or Raspberry - I bet I'm not the only one having trouble spelling that) - is that we are not allowing kids to create anything in computer studies these days. They spend their time learning how to use over-price commercial software packages, they learn to be employees, not creators. The idea behind RPi is that this is a way to equip a computer lab for less than the price of a classroom load of Windows and Excel. And it can be used with existing monitors, TVs, keyboards. Hell the kids can use their mobile phones to power the damme thing! My guess is that the first 10,000 didn't go to school kids or their parents. It went to geeks, possibly old geeks who remember mucking around building their own computers in the 80's! Will it catch on? Who knows, but there are plenty of kids still playing with lego and creating things there - so I don't see why they wouldn't want to create their own computer! What's the Technical Specification or Raspberry Pi? Same as model B with the addition of an ethernet port and 2 USB ports. Well pi is that well known constant: 22/7 or 3.14… an irrational number which is the ratio of the diameter to the circumference of a circle. Raspberry? Well it was a small berry fruit the last time I checked. Why Raspberry Pi - I have no idea - but I'm guessing there would have been law suits if they called it Apple Pi! More Computer Articles by Me! Are you tempted by the Raspberry Pi? Would you buy it for your kid? We weren't quick enough to get one of the first batch yesterday, but yes we'll be getting one. It seems much more complicated that the Sinclair Spectrum I learned to program on! My older son will be 6 later this year, it's about time he learned to code!